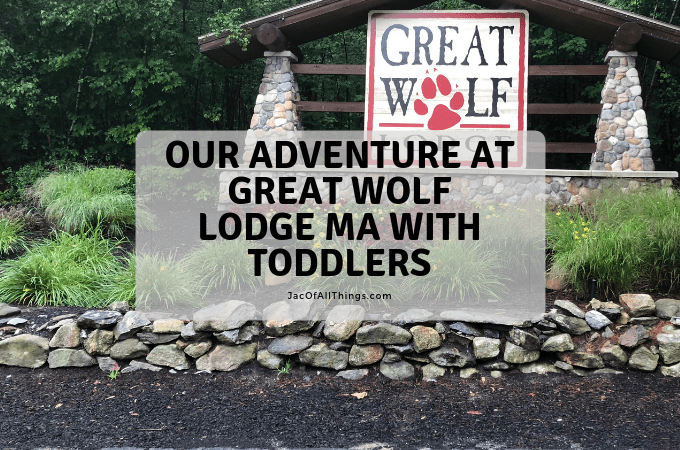 We decided to skip having a typical birthday party and celebrate my daughter’s second birthday at Great Wolf Lodge MA (also called Great Wolf Lodge New England), located in Fitchburg, MA. 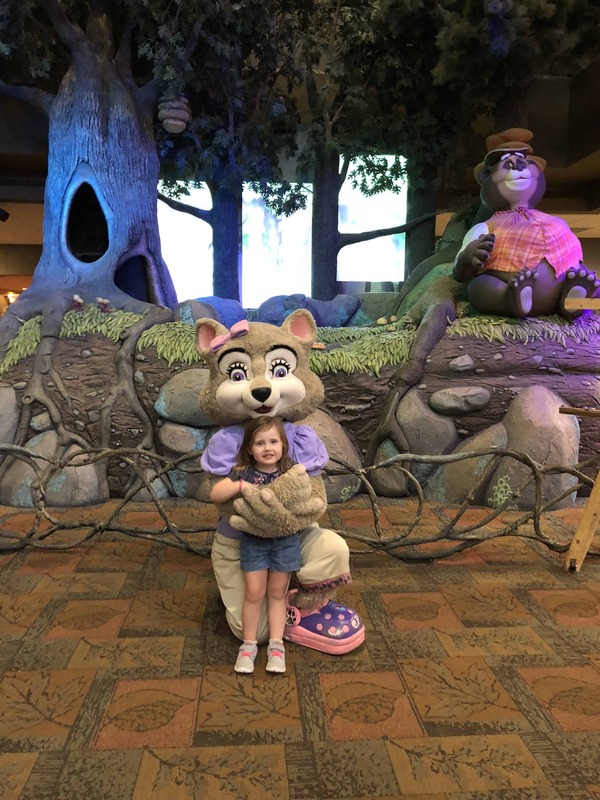 We love family adventures, so this was the perfect excuse for a weekend getaway at a kid-friendly location. We were all packed, ready to go, on the morning of our (originally scheduled) adventure, when my husband came down with a bug. There was no way he was getting out of bed that morning! 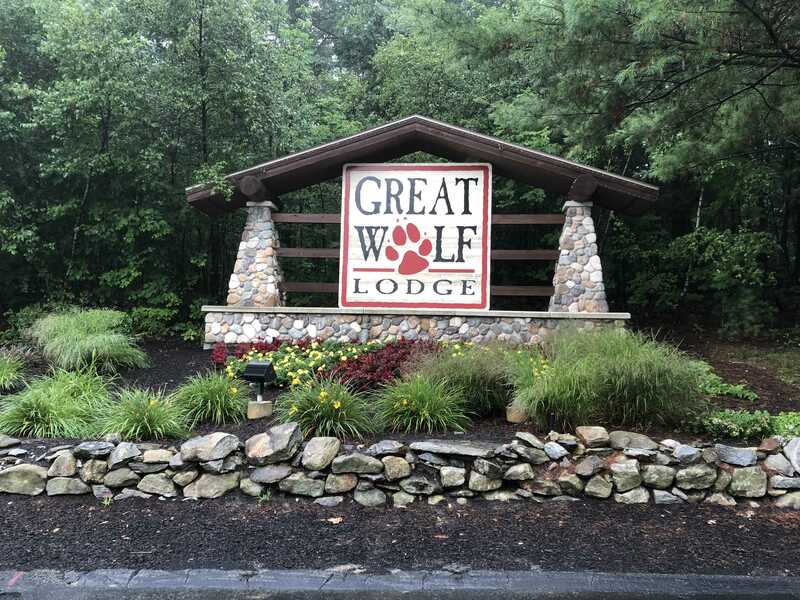 I frantically called Great Wolf Lodge to discuss out options, and I was blown away by their compassion and willingness to work with us on an alternative. Talk about great customer service! They were able to quickly adjust our trip to the following weekend (with no charge). One week later, we were off and on our way. Prior to leaving, I completed mobile check-in, which was simple and easy. This saved us a TON of time upon check-in. There was a rather long line of people to check-in in person, and the mobile check-in line was practically empty. Upon check-in, my daughters (newly 2 and 3 years old) were given adorable wolf ears to wear. The lobby was fun to explore and there was an ongoing stream of activities to participate in. We were given wristbands to wear that served as our room key and could be scanned to charge items back to our credit card on file. These were so convenient as we rarely had to carry-around our wallets/bags. 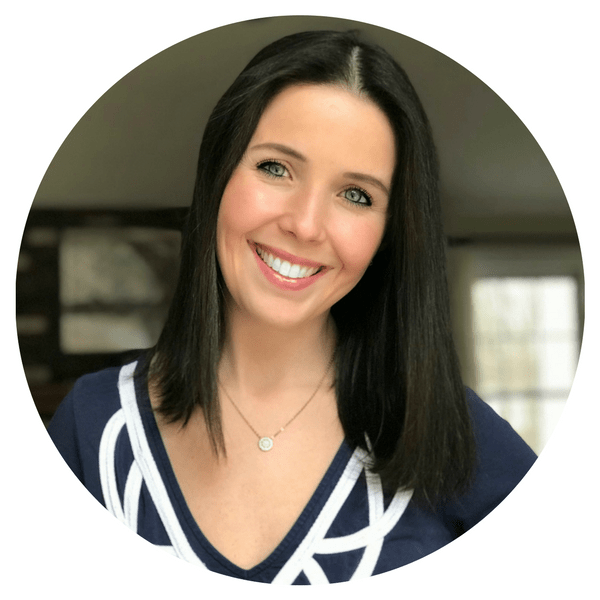 We had packed our swim gear separately so we could access it easily before our room was ready, but we were pleasantly surprised that our room was ready early and we could get situated and changed in our room. Our room was simple and clean. There are plenty of themed rooms to choose from, but we opted for a standard room as we didn’t think our daughters, being so young, would care. When we go back in the future, we’d likely get a themed room for the experience, especially as they get older. After getting on our bathing suits, we were off to the water park. 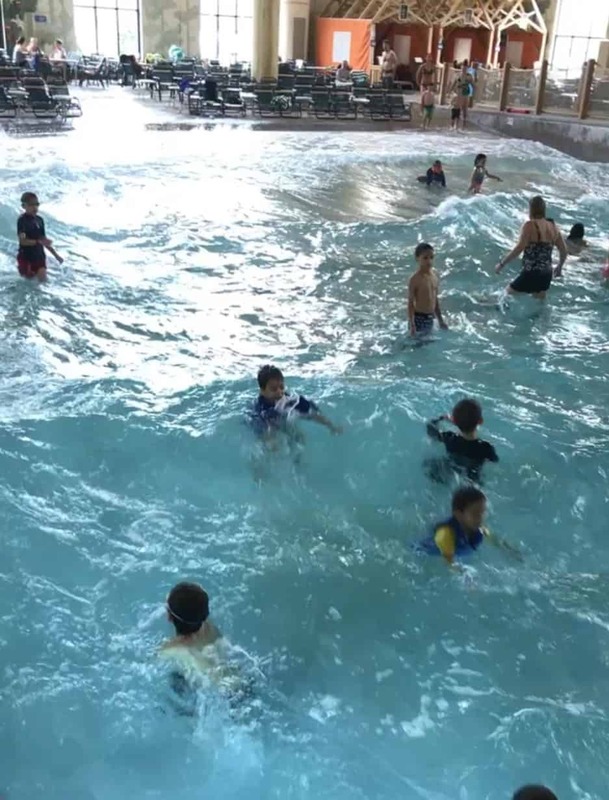 At Great Wolf Lodge New England, the water park is actually split into two separate rooms. In one room, there is a kid’s pool, (zero-depth entry with a maximum height of 18 inches), wave pool, and slides, and in the other room, there is another kids pool (complete with a water tree fort), a “lazy river”, an activity pool (for basketball), floating lily pads, a hot tub, and more slides! Scattered throughout both pools were chairs and tables as well as private cabanas that you could rent. The temperature is set to 84 degrees, and its easy to forget you are inside! 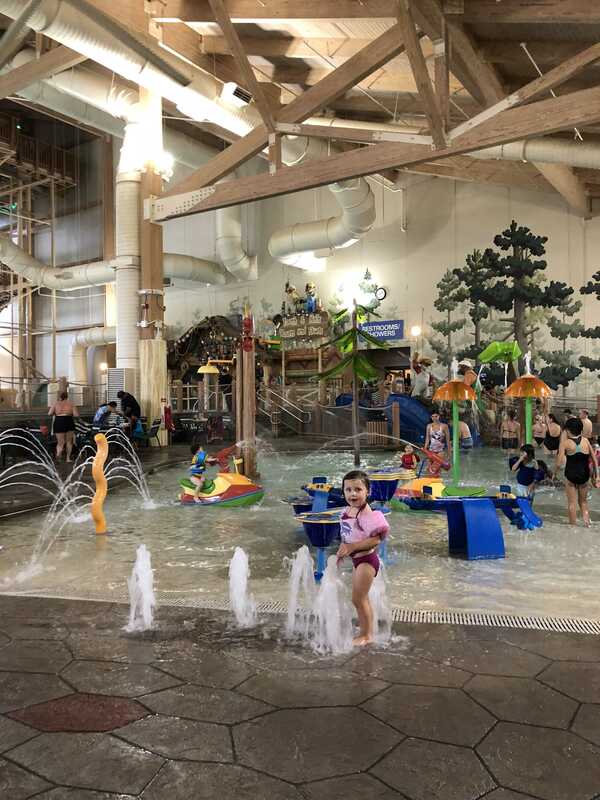 We brought puddle jumpers for our daughters to use, however they preferred to use the life jackets provided by Great Wolf Lodge. (They came in many sizes including infant, but they are first come first serve!) Towels were provided by the resort. We spent the next few hours enjoying our time in the water and bouncing between the various water park activities. 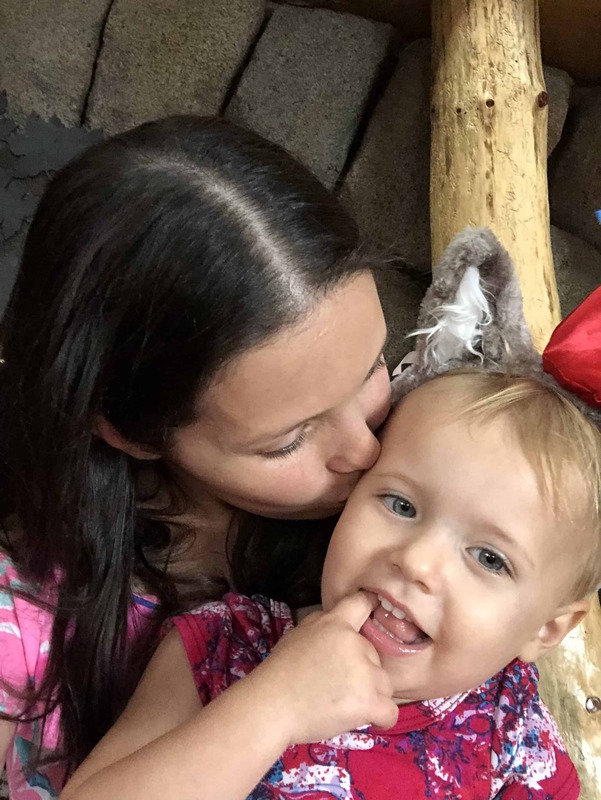 Because our daughters are young, our time was mostly spent in the kid’s pools and smaller section of the wave pool, but there are really activities for all ages to enjoy. My husband and I were able to sneak in a few rides on the slides. For a good thrill, the Wolf Tail slide is a nearly 20-foot free fall slide with a 360 degrees loop. The ground literally drops out from under your feet in this slide! After enjoying the water park, we returned to our room for a quick shower and to get ready for dinner. 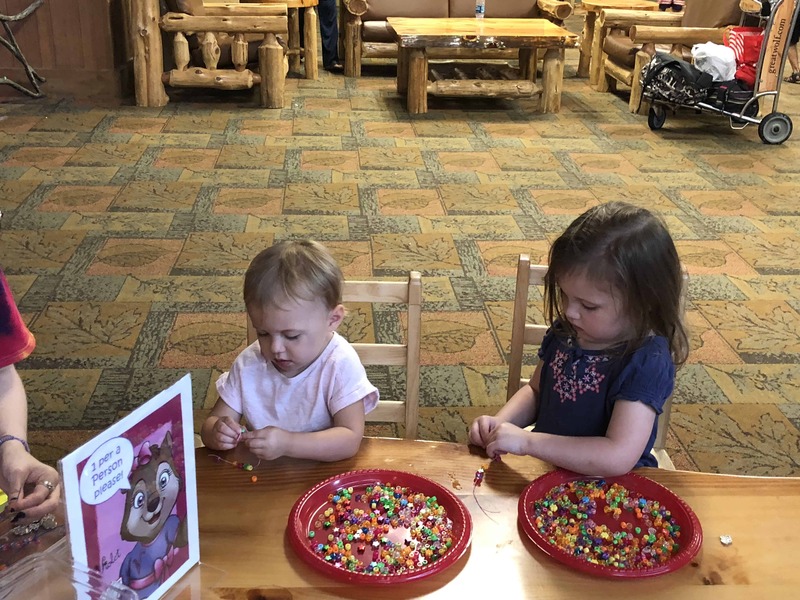 We had plans to eat at the sit-down restaurant (the Lodge Wood Fired Grill) but after seeing how many activities there were to still enjoy, we opted for a quick bite instead to make the most of the evening. We placed an order for a pizza and salad at Hungry as a Wolf (take-out style restaurant) and explored the resort a bit more. 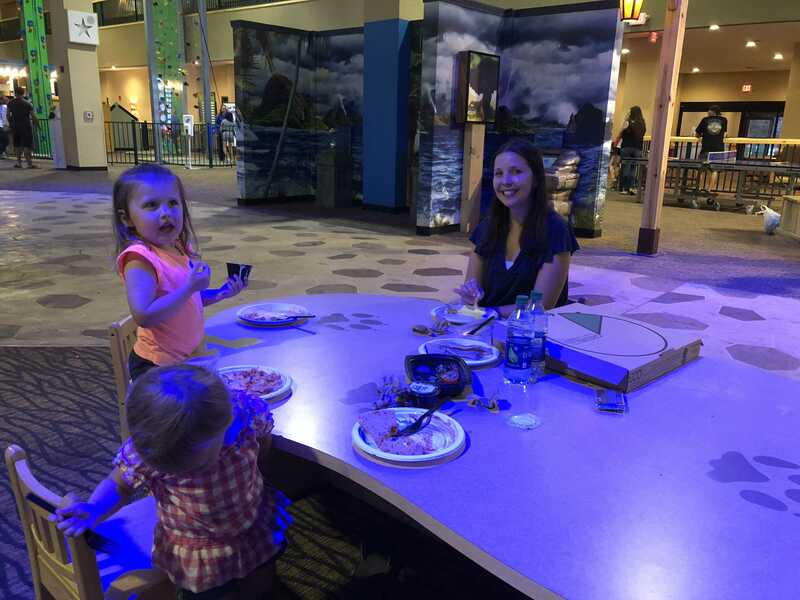 We found a nice quiet spot to eat close to the ropes course and tried to get some food in our kids before they were off running to tackle the next adventure! 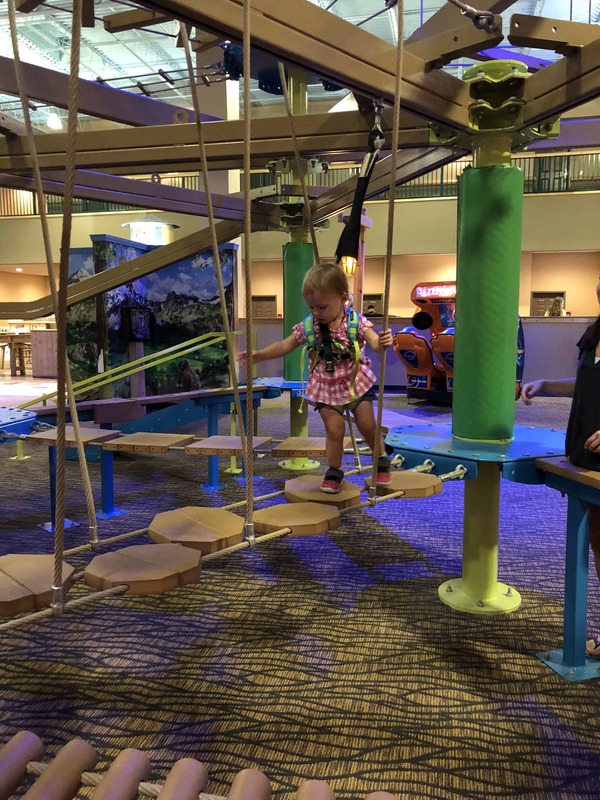 The girls enjoyed some rock climbing and arcade games before heading back to the lobby for story time and the Forest Friends show. We stayed for a game of family trivia (well past bedtime, but we were in vacation mode!) and then headed back to our room for a night of sleep. 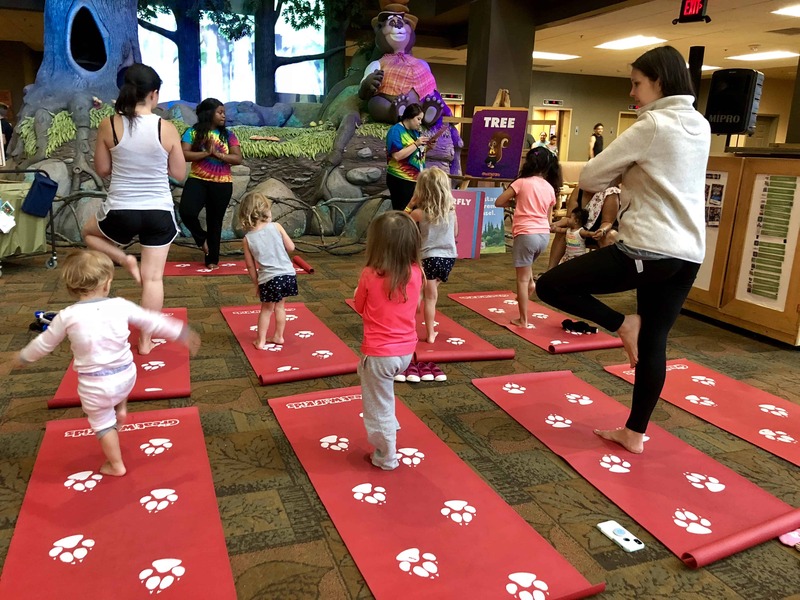 The next day, we kicked off our day with yoga in the lobby. 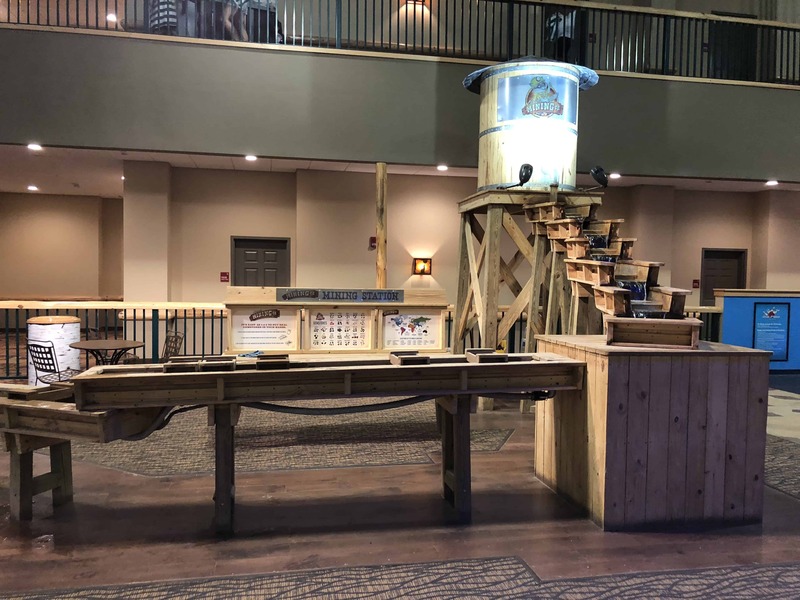 Side note about the daily activities at Great Wolf Lodge… Each day, a new activity list was posted, which included activities like yoga, balloon animals, make-your-own friendship bracelet, family trivia, story time, character meet-ups, and more! These were all free of charge for guests! 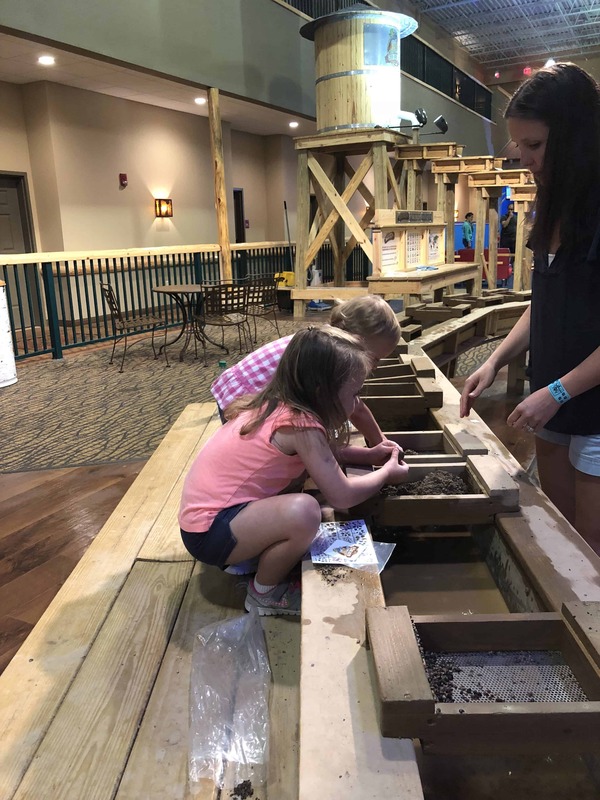 The activities staff at Great Wolf Lodge MA did a great job keeping the kids engaged and making it a fun experience for everyone. We then had breakfast at a local dinner. There were plenty of options in the resort, but we were looking for something quick (and a bit cheaper) to enjoy so we could get back to the resort for a fun-filled day. We decided to spend the day doing dry activities rather than going back to the water park. They also went mining for rocks and gems. And of course, rock climbing again! We headed back to the lobby a few times during the day for some of the free activities that they were offering. The girls made friendship bracelets, complete with a paw print charm. And they met characters and had balloon animals created. 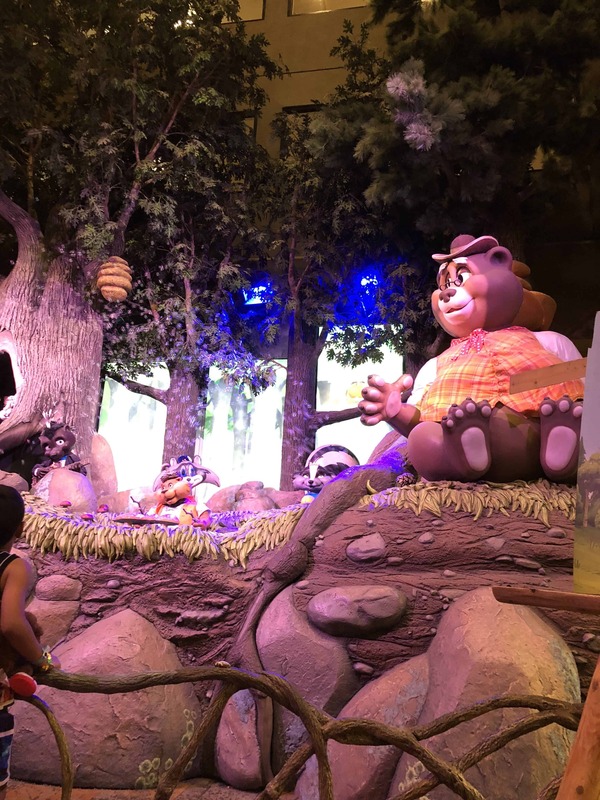 We continued to bounce around the various attractions and activities throughout the day and enjoyed some time in the arcade as well! After grabbing a late lunch at Buckets Incredible Craveables, we sadly said our goodbyes and headed home. 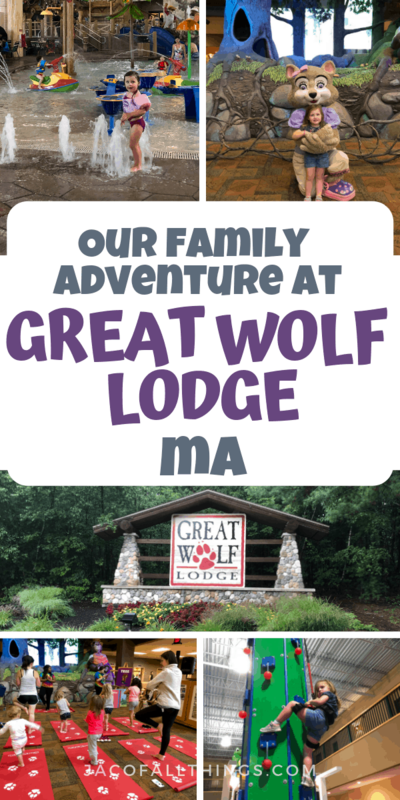 Our weekend getaway at Great Wolf Lodge MA was the perfect birthday celebration. 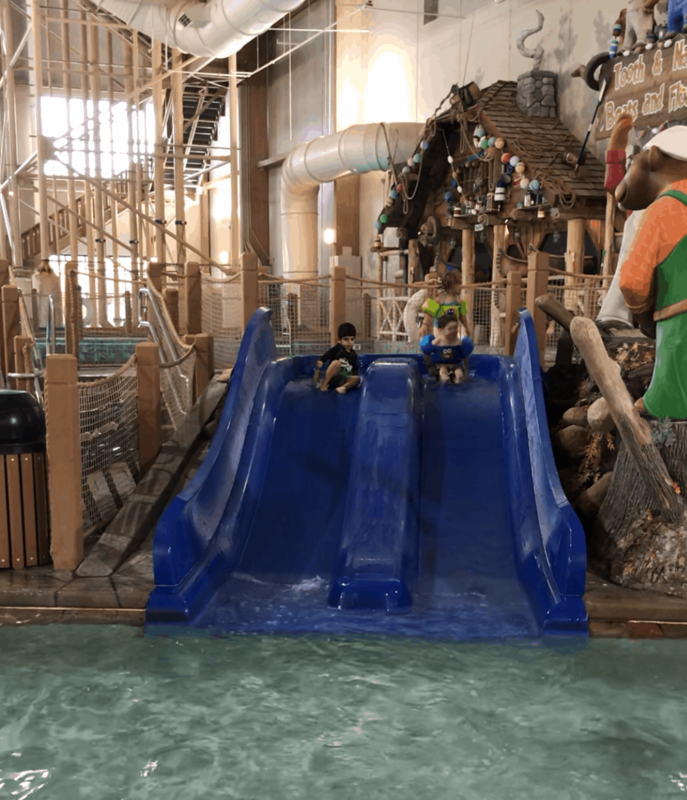 We can’t wait to go back and continue to enjoy all that Great Wolf Lodge has to offer! Check to see if there are discounted stays available via Groupon. Also, don’t be shy about calling Great Wolf Lodge and asking them if there are discounts or special offers available. Use the mobile check-in feature to avoid waiting in a long check-in line. Pack your swim gear in a separate bag that can be easily accessible. If your room is not available upon arrival, you can simply take your swim bag to the water park changing facilities to get changed. 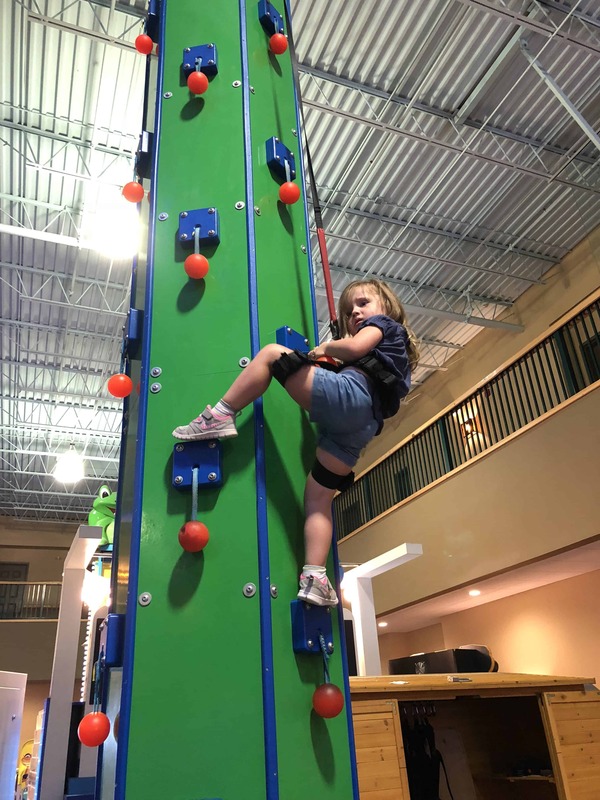 Bring closed-toe shoes (sneakers are ideal) to participate in rock climbing and the ropes course. Take a look at the daily activities schedule that is posted in the lobby each day. Identify which activities you want to participate in, and note the time. The lines for the slides may appear to be long, but often its several lines, each leading to a different slide. Before waiting in a line, ask around to make sure you are in the right line. Before purchasing tickets for the various attractions, add up the cost to get an attraction pass (i.e. 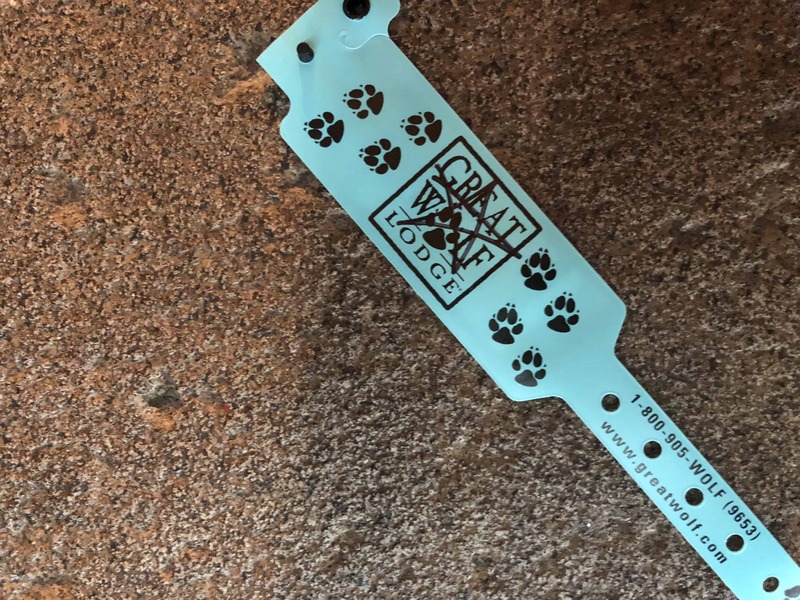 Pup Pass, Paw Pass, or Wolf Pass) which allows you to pay one fee for multiple attractions. Don’t wait to reserve your chairs at the water park! They fill up fast!